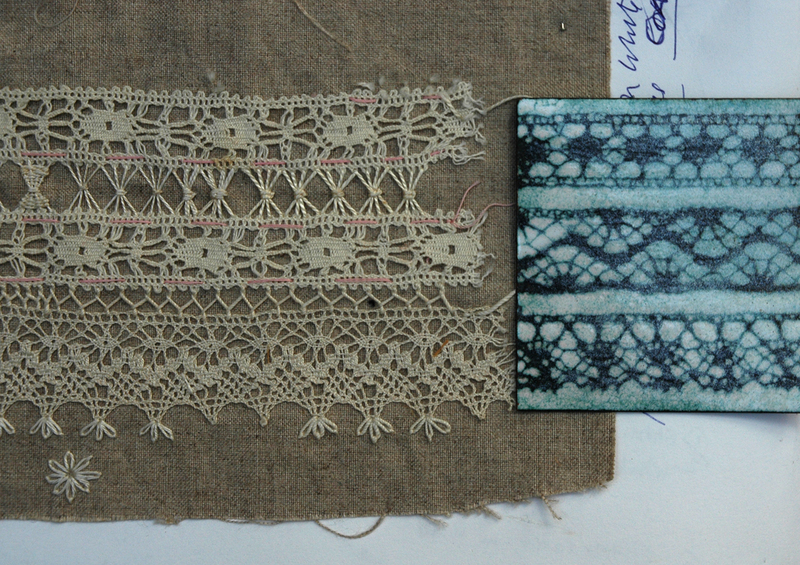 I am slowly including all my recent stitched work into the blog. Sorting through the Embroidered Enamels for the Gallery Pages I thought I should show the research underpinning what has become a main preoccupation for me, enamel fabric or fabric enamel – whichever way round – they are difficult, expensive and time consuming to make but I will never tire of developing them. 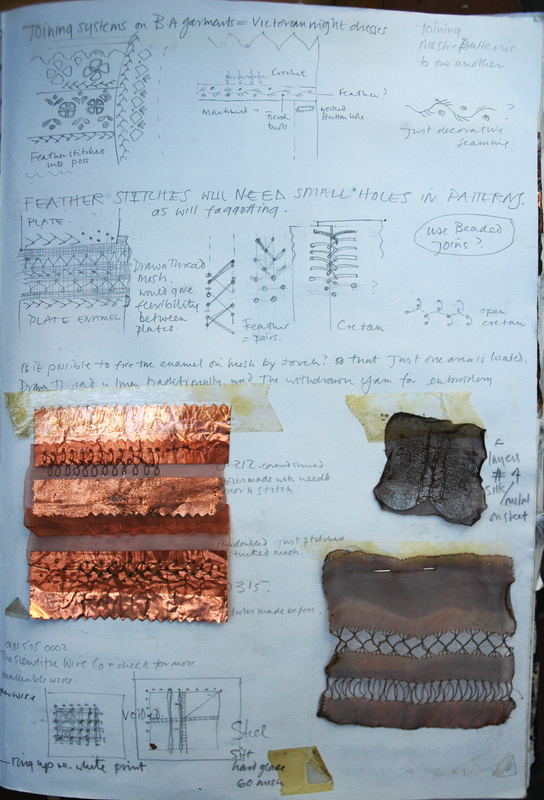 The first pages of my enamel research book show how I referenced fabrics to pattern and construct the strips of enamelled copper to look and behave like fabric. This now looks very focused and organised, but I only remember being absolutely lost amidst the wealth of ideas and accompanying technical information I was having to assimilate. The temperatures of the kiln were mind numbing; I cook on an AGA so have no idea of any cooking temperatures, what exactly does 800 degrees feel like – pretty damned hot – more to the point, an open kiln at that temperature looks scary as well. At the research department at UWE. Bristol I was surrounded by researchers into enamel who were were making such exciting and unusual things and I didn’t realize at the time that I was working with enamellers at the forefront of innovation into this craft, and I was being given the chance to develop textile techniques within their research area. I was both excited and daunted but decided to stick with what I knew, stencilling and stitching. 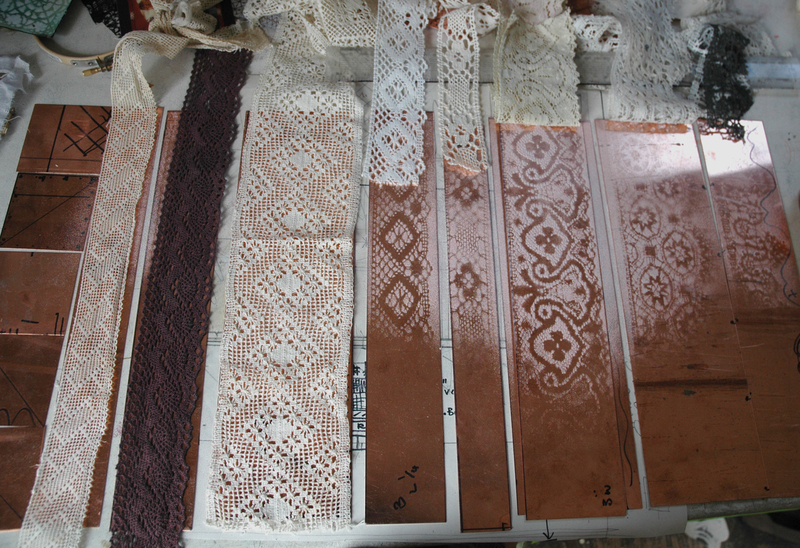 I used lace, Broidery Anglaise, crochet, any fabric that was patterned with hole and I drilled holes in the metal plates, prior to enamelling, in order to stitch. I hated this drilling; to stitch even moderately neatly you have to drill very neatly and you have to sort out all the placements first…my work books are full of stitch diagrams ….so how else can I get these plates onto the fabric without the drilling? It ocurred to me that the small metal shapes were like shisha mirrors, found on Indian fabrics so I started to applique them into position using this technique. Fabric grounds were really too lightweight to carry the metal shapes and when they are heavy enough they become very coarse so I tried other materials; the metallic leathers were the most successful and I have several large hides waiting for an opportunity to be decorated. Meanwhile I decided look at metal fabrics which, being woven, are more amenable to being worked like traditional textiles. 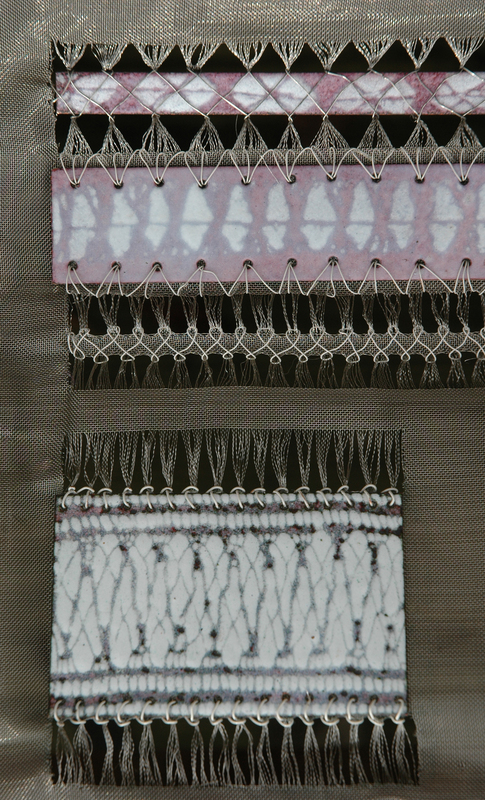 I bought some amazing woven metal fabrics from The Cloth Clinic, the owner – and at the time a fellow researcher at UWE Bristol, Janet Stoyel – let me buy some of her specially woven fabrics – sadly no more were made available to me after this. 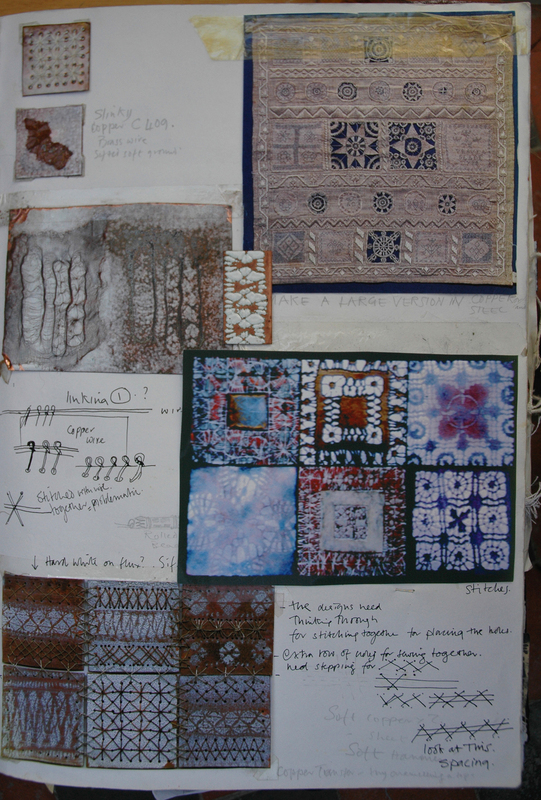 But I used these particular fabrics to make a series or samples based on traditional white work sewing. 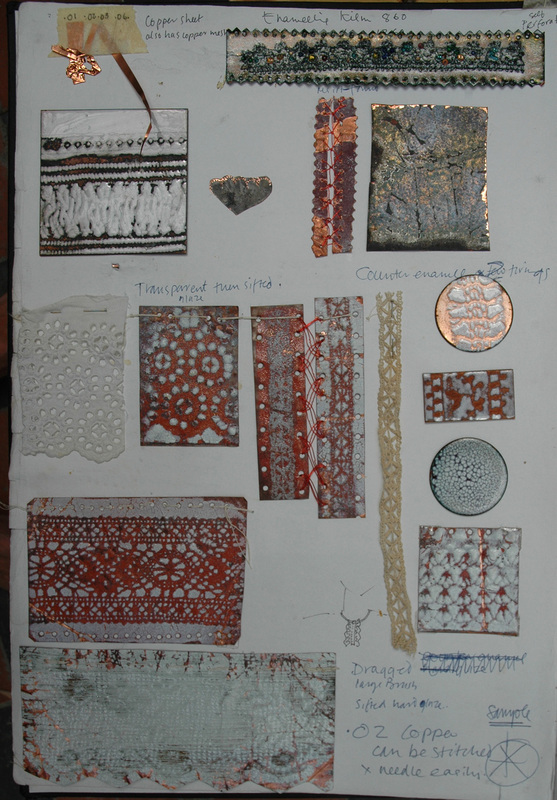 The embroidered scrap of copper below is from this collection of metals as are most of the metal fabric samples in the work books; although some of these metals are available elsewhere the Cloth Clinic’s fabrics are really special and worth looking our for. 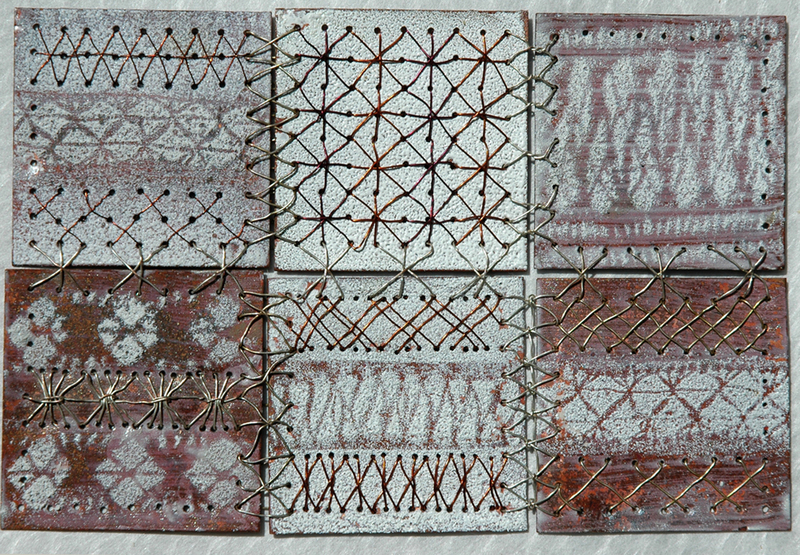 But cost and unavailability of these metal fabrics made me rethink how I could develop these ideas, I even thought of taking up weaving some for myself from copper and steel wire on a small frame…still a possibility……. 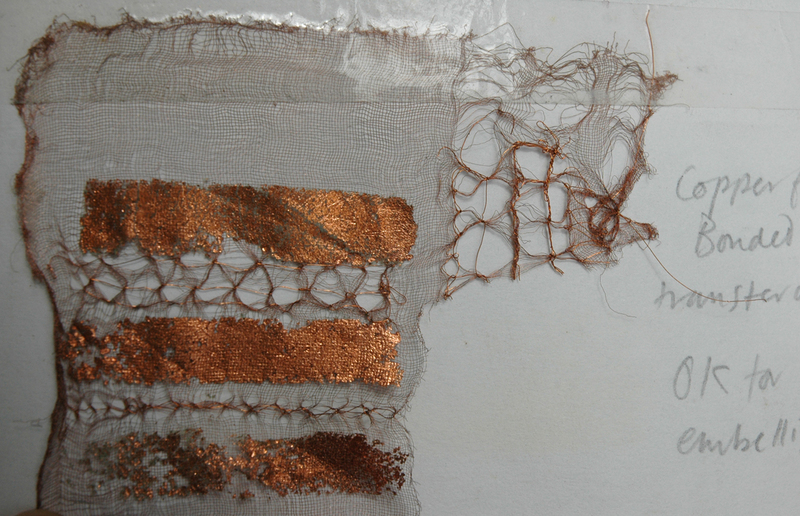 scrap of copper fabric with drawn thread work and printed foil. Eventually, after about 18 months I felt confident to design and make a stainless steel, white enamel sampler .It is based on white-work traditional embroidery designs and vintage fabrics have been used as stencils. The different colours are made by heat reacting with the copper at different temperatures of the individual kiln firings and only white enamels were used for this. 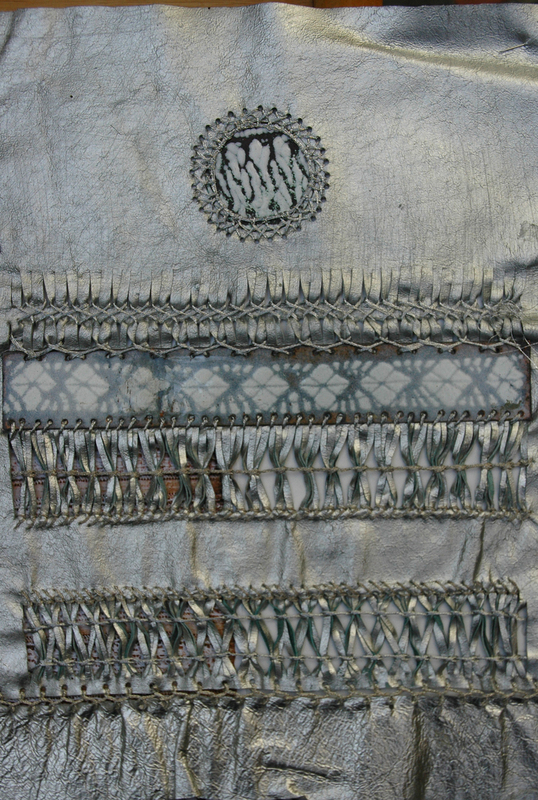 The applique and shisha techniques were again used and the ground has had drawn – thread – work worked into it – very hard on both the eyes and the fingers – the stitching is in steel and copper wire. upside down detail of steel sampler. 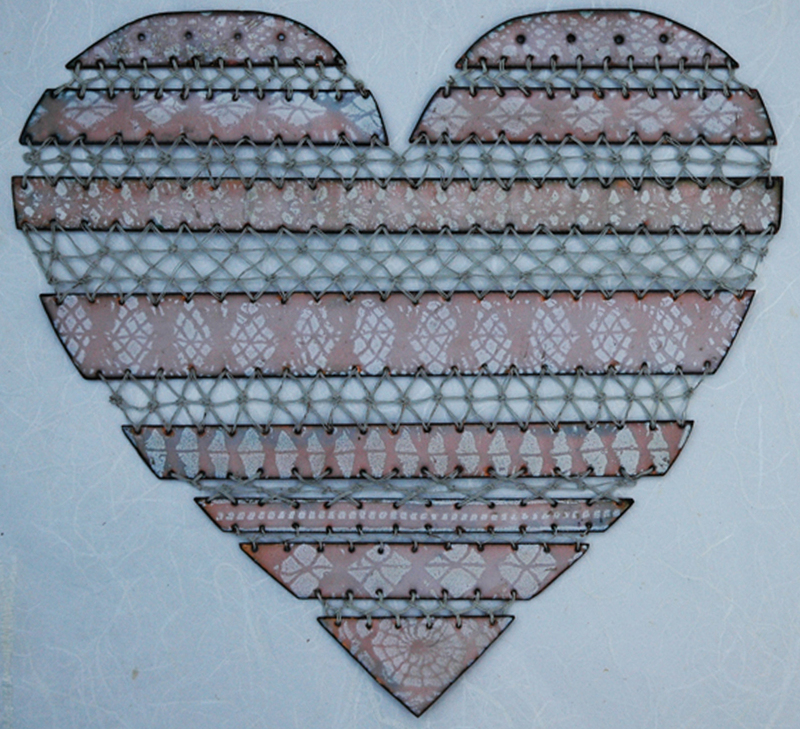 detail of enamelled copper mesh heart - well what other emblem did you expect to find? Another idea which I had also been developing is patchwork enamel, I had quickly worked out that this was the easiest way to produce enamel fabric, but the thought of drilling all those holes to stitch the plates together, put me off – but now I was used to working with the metals so I returned to a small sample I had made in the first year of my enamelling experiments. 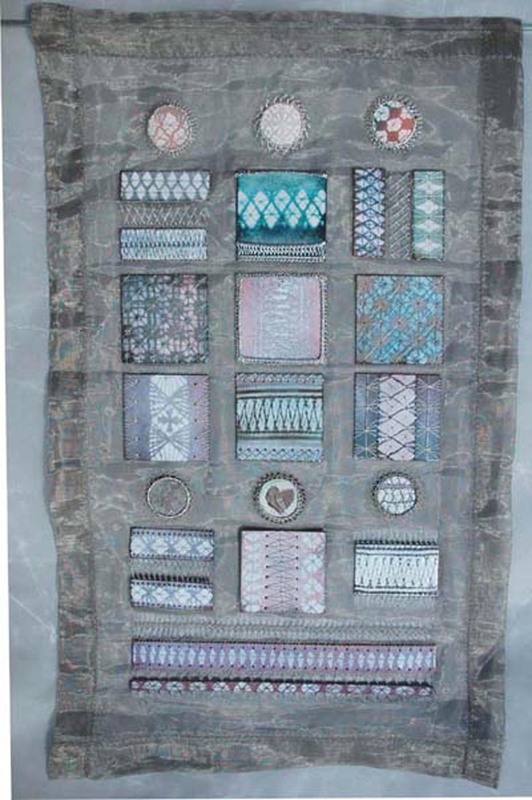 patchwork enamel sampler stitched and embroidered in wire. 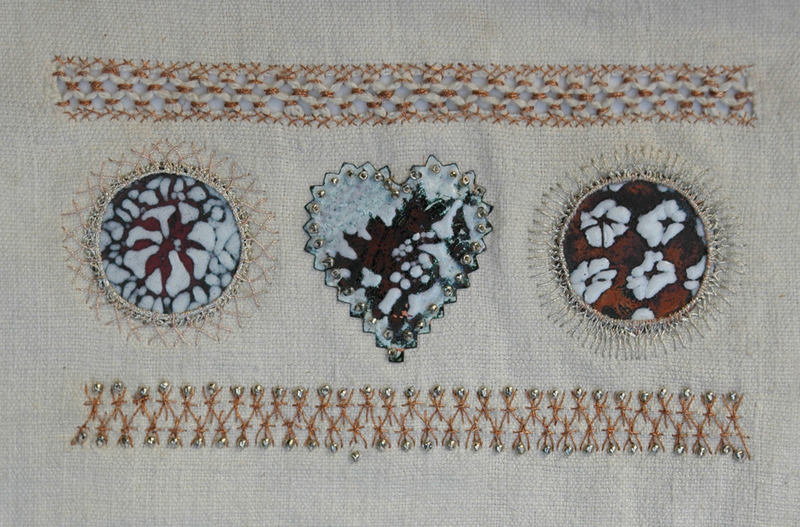 I made a larger and simpler version of the sample above and the piece of fabric is about 90cms square, a yard of fabric.The separate plates are stencilled and then stitched together with white coated copper wire, suddenly I had a piece of fabric that draped when held in my hands. 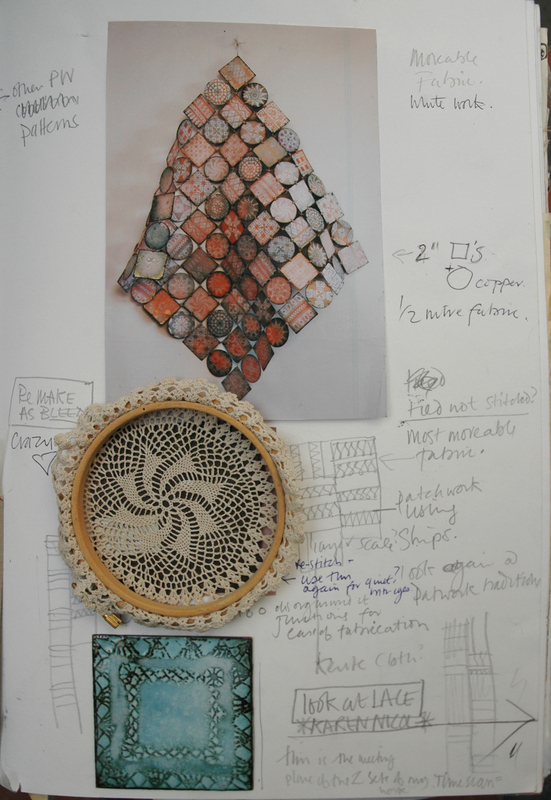 Below is the page from my research book with one of the stretched crocheted fabrics used to stencil patterns onto the copper plates. I looked again at other types of samplers which could be developed into drape- able fabrics…this small design below was for embellishing espadrilles in a book I had written called White on White by Coats Crafts UK now sadly out of print. I developed a strip sampler as with this type of construction the stitched strips of enamel can be rolled and it behaves much more like fabric, this led me to many more developments, one of which will be used for the Severn Seas Skies hangings featured in the last posting on the blog. 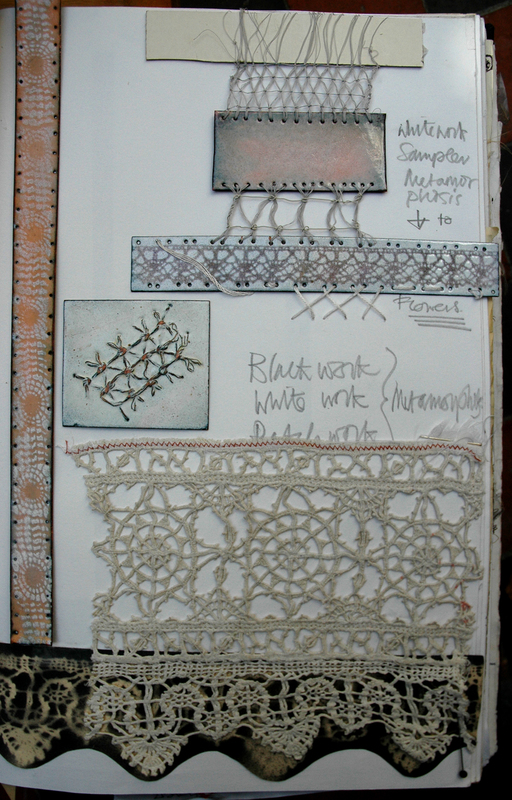 workbook page of stitched strip samples for white work patchwork. The size of the copper strips has recently become much larger as I have experimented with the amount of weight that the rows of stitched wire can carry. I can eventually make very large sheets of fabric using this method, at present they are about 2 metres long but only 34 cms. wide, this is all my small kiln will accomadate, but I could get up to half a metre wide in my large kin – it would weigh an awful lot though. 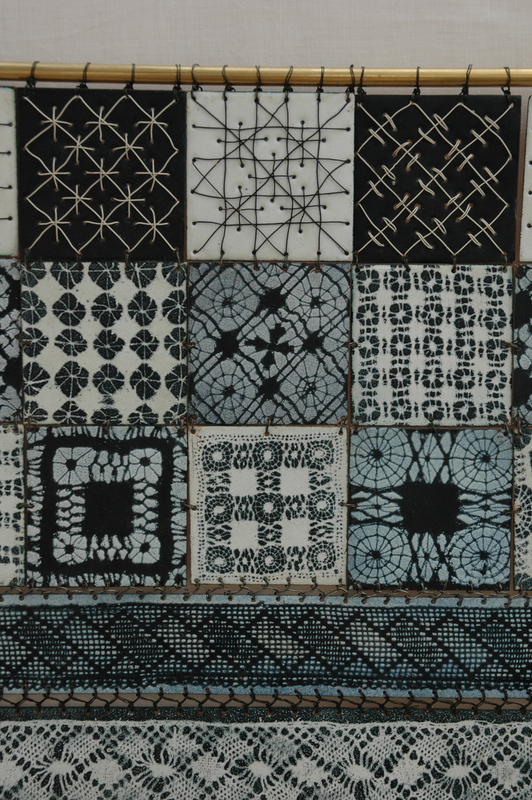 detail of top of Black Work Patchwork, with stitched and stencilled enamel. 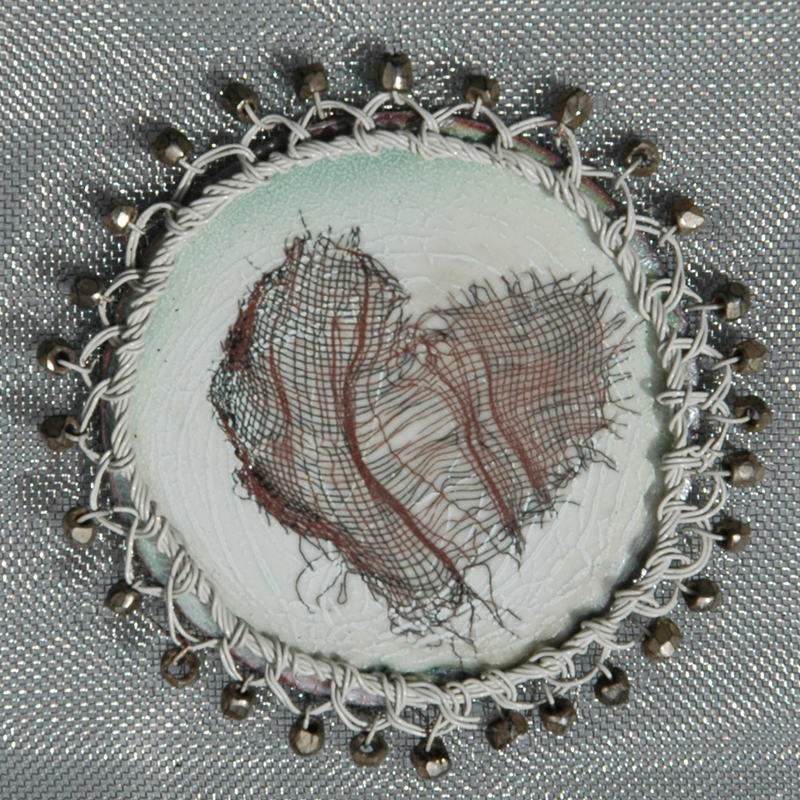 Categories: Drawing, Hearts, Stitched Enamel | Permalink. recommend I like it each of the recommend good job.